For my boot loaders I need the functionality that I can keep memory ranges from being erased while downloading the rest of the application. P&E provides a GDB server which interfaces with their probes (P&E Universal Multilinks, Tracelinks, …) and as well with the OpenSDA present on many of the Freescale evaluation boards. 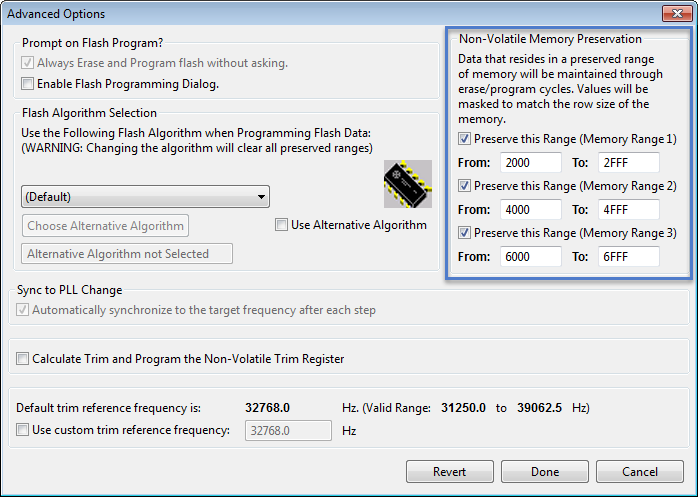 In CodeWarrior there is an option for ‘Advanced Programming Options’ which allows to preserve memory of the microcontroller FLASH (see “Programming part of flash“). However, that option or button is not present in the Eclipse version of the P&E GDB server (e.g. in Kinetis Design Studio). 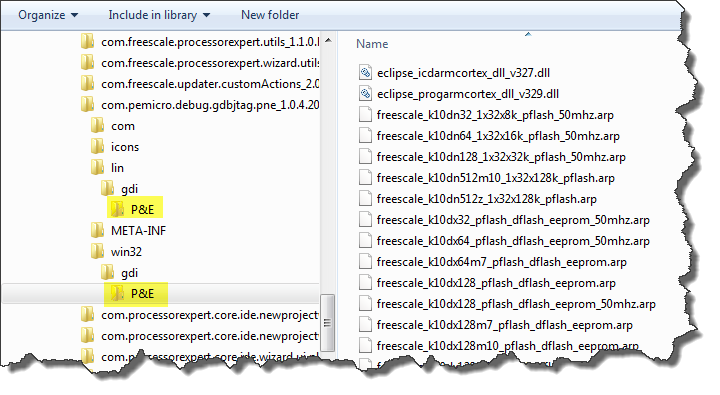 So how can I preserve some areas of FLASH in Eclipse with GDB? PRESERVE<number>_ACTIVE set to “1” (enabled) or “0” (disabled). PRESERVE<number>_START is the start address in decimal format. PRESERVE<number>_END is the end address in decimal format. 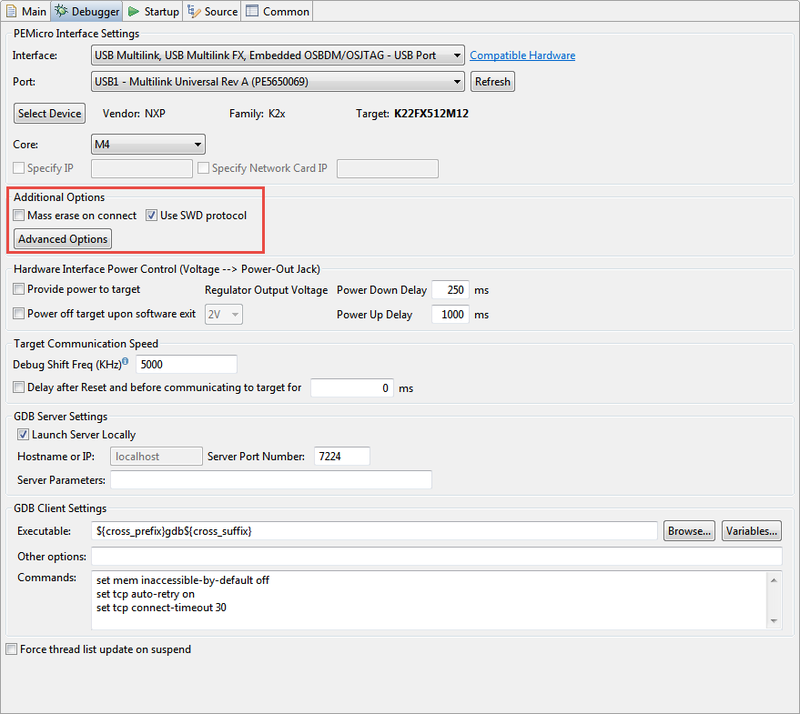 Enable sharing of the launch configuration, see “Sharing Debug Configuration with Eclipse“. Well, things came to a screeching stop at this point. Unfortunately the settings the P&E GDB Server .launch files were kind of similar to the ones in their CodeWarrior implementation. But different. I tried guessing and poking around the different string attributes, but….. I had to gave up :-(. Ahhhhhhrggggg! Well, my wife could tell you that I can get really grumpy if I know that something ‘has to be possible somehow’, but it does not work. I don’t like to give up (anyone does?)! So I did another round of poking and googling, and stumbled over a P&E application note from 2008: “New Programming Feature For Non-Volatile Memory – Preserve Range”. And that article opened the door to do what I need :-). So with this I know which flash programming file is used :-). I open that file in a text editor and search the line with NO_BASE_ADDRESS. 💡 In any case, I recommend to make a backup of the file before doing any change. Do *not* change the NO_BASE_ADDRESS line. Multiple PRESERVE_RANGE lines can be added. The PRESERVE_RANGE line states as first number the start address offset (from NO_BASE_ADDRESS), and the second number is the end address offset (again from NO_BASE_ADDRESS). 💡 See details in “New Programming Feature For Non-Volatile Memory – Preserve Range” about the address calculation. 💡 Notice the warning about the modified CRC16. This makes sense, as I have modified the file. I think the last two bytes in the file are the checksum. To disable the change, I can either restore my backup file, or comment the change in the file. Preserving memory ranges in Eclipse with P&E GDB is not that simple with a dialog as in CodeWarrior. But very powerful for me after I have understood what needs to be done. It would be nice to have this in a dialog as in CodeWarrior, but until then, I have a way to make it happen. This entry was posted in Debugging, Eclipse, Embedded, Tips & Tricks and tagged Debugging, Eclipse, P&E, Processor Expert, Tips&Tricks by Erich Styger. Bookmark the permalink. This is very important information for anyone who want to do custom bootloaders and may be making a debuger for arm. thanks for sharing, makes one more thing easier, though I do not use P&E much, mostly openocd works for me, will check if it supports this. 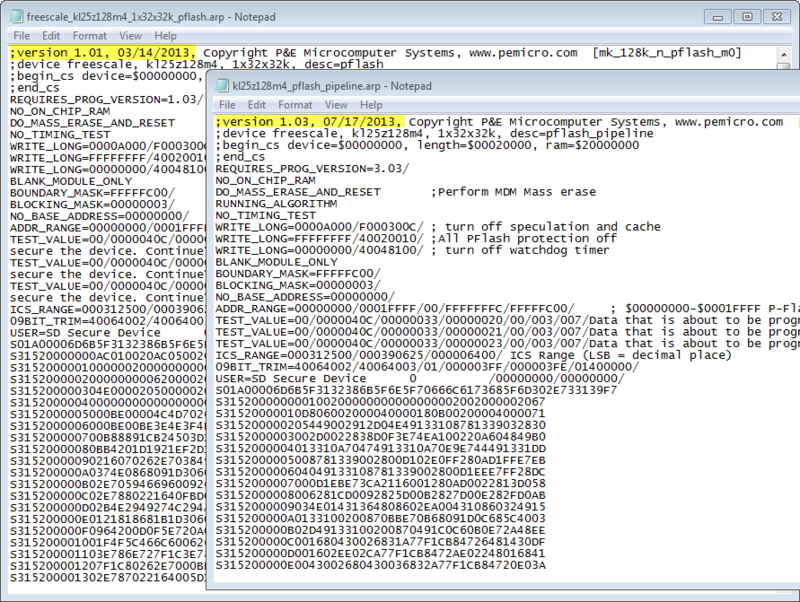 Apparently, there is now a seperate OpenOCD debug plugin http://gnuarmeclipse.livius.net/blog/openocd-debugging/ with full configuration pages. Do you know if there are plans to support this natively in future versions of the plugin? I had asked P&E if they could do this in future version of their tools, but I don’t know if and when this will happen. indeed, things have been changed after that post. I have the article updated now. Also, have you been able to actually debug this application successfully with those options? That is, can you debug the app without a bootloader at all? And so on… Note that the disassembly address range does not have the application flash offset (0x8000 in our case) applied to it, so that could very well be a bug? It’s also not clear that it’s only a GDB display issue, as manual control of the app using stepi instructions also leads to failure. If you think this is a P&E problem, I will contact them directly, but my first question is still – how were you even able to debug your non-bootloaded application with a flash offset? If you have loaded an application like that, you must inform GDB about the symbols and where they are loaded. So if you are just debugging the application, but have not loaded the symbols of the bootloader, then gdb will not know anything about the bootloader. Sorry, I guess I didn’t explain very well. 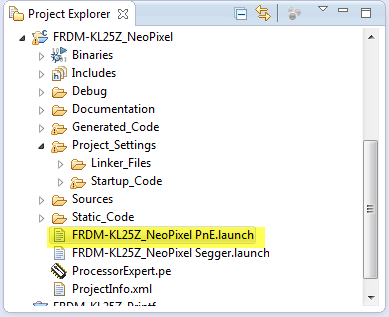 When I say we are debugging, I just mean through KDS with the bug icon button – nothing out of the ordinary. The application seems to be flashed to the offset location that we set up as per the instructions above. The bootloader doesn’t even enter the picture because we haven’t flashed one. After starting the debug session, we get the dreaded “No source available for 0xFFFFFFFE (0xFFFFFFFE)()” error. And this is for the application that GDB itself loaded but somehow isn’t correlating to the offset flash. I can’t be sure it’s only a correlation problem, because even stepping through the code using GDB “stepi” instructions fails. Anyway, I think I will just forward this to P&E if they are in charge of the Eclipse plugin. I was hoping you ran into the same issue when debugging the application after following the setup above. Do you by any chance have this project in Github? In my build process I just added the bootloader binary to the linker, which links it to the first 8Kbyte of the flash address. The normal user software is offset by 8Kbyte, and behaves normally, after the bootloader jumps to it during debugging. This way the Jlink Segger I use would actually download it every time, except that it does not, because it checks if an erase is actually necessary. There must be something at the first 2 words of the program flash, that the MCU can start to execute. Erich, is there a way to do a similar thing (ie preserve memory ranges) when using a Segger J-Link ? not that I’m aware of. I had to use that feature in P&E as it does a mass erase of all flash blocks, while the Segger J-Link only does a download to the changed blocks. I believe it might be possible with the J-Link software, but quickly checking the manual I have not found a way. Maybe I have missed it? I have a custom board with KE04Z128VLD4, codewarrior 10.6.4, multilink Universal Fx debugger , set the correct processor in project and debugger, tried also to select manually arp file, but always get the same error. 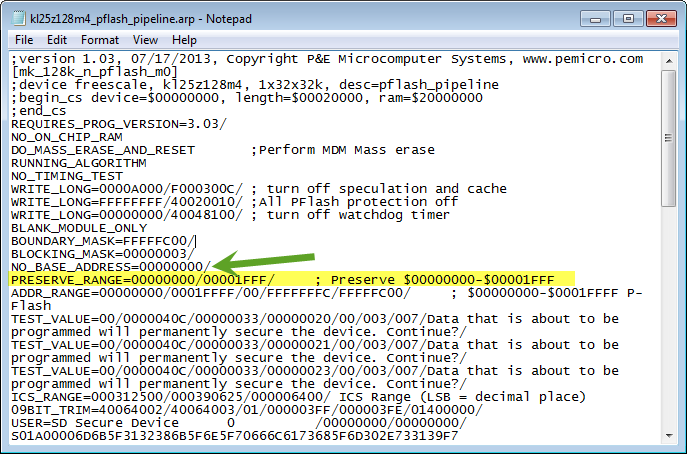 INF: Error loading .ARP file : C:\Freescale\CW MCU v10.6.4\MCU\bin\plugins\support\ARM\gdi\P&E\ke04z128m4_pflash_pipeline.arp. Set PC and Run Error. 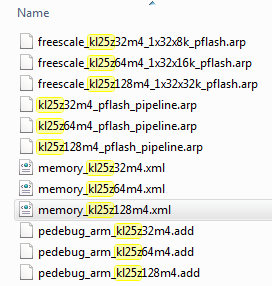 Error loading .ARP file : C:\Freescale\CW MCU v10.6.4\MCU\bin\Plugins\support\arm\gdi\P&E\freescale_ke04z128m4_pflash.arp. Set PC and Run Error. i can’t see what’s wrong, do you have any idea? 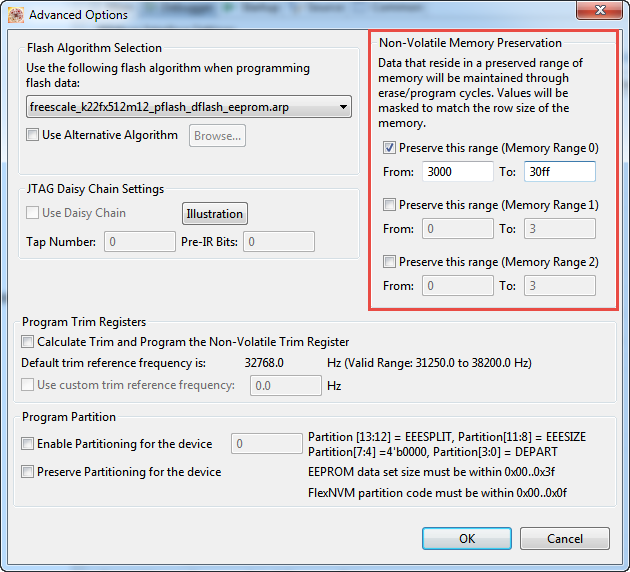 I recommend that you use the CodeWarrior for MCU10.7 (or 10.6.4) as they can do the memory preservation in the P&E dialog. This article has been written originally for GDB where at this time this functionality was not present in the GDB version (now it is). So if using CodeWarrior for MCU, you do not need to patch the files.